I just learned from my friend Susan Keith, that her husband James Kiberd is putting aside his brushes and palette for a week or so to temporarily replace a major character on “As The World Turns” (the show that won Best Show and lots of other Emmys this year). James will play “Hal Munson”, a cop with a dry sense of humor. After all the time James played Detective Trevor Dillon this will be a cakewalk. With James’ art exhibits, theatre, and TV work he still donates all kinds of time and effort to children. 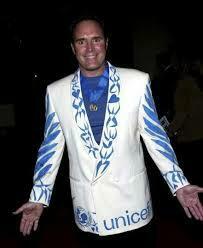 He has been a great friend of UNICEF and Kiwanis. I have enjoyed the time we have spent together in support of the UNICEF/Kiwanis global project. For all you fans, I will let you know when the episodes will air as soon as I hear. It’s a proven fact that zipping up a small child’s snowsuit will cause him/her to wet her pants. There is no known cure for this. Give a man a fish and he eats for one day. Teach a man how to fish and he’s gone every weekend! “No, I don’t think so,” said the caddie. Before Linda became engaged, she was quite the beauty, and didn’t mind letting her boyfriend know it, too. “A lot of men are gonna be totally miserable when I marry,” she told him. There are bigger things in life than money — bills, for instance. “Madam, please don’t get hysterical,” said the lifeguard. Jesus loves you, but everyone else thinks you’re in need of improvement. Later that day, the lady is home telling her husband about her encounter with the cop. “Well, dear, what exactly did he say?” asked the husband. “He said the reflector is broken,” replied the Amish lady. “I can fix that in two minutes. What else?” asked the husband. A doctor answers his phone and hears the familiar voice of a colleague on the other end of the line. “We need a fourth for poker,” said the friend.